Saw a mountain. Climbed a mountain. As we pack our bags, Umbria Jazz is stepping out. Every day from noon to well past midnight there are official and unofficial performances. We passed part of yesterday afternoon in the Giardini Carducci listening to the KJ Denhart Band and the Allan Harris Quintet, while eating porchetta and jambalaya. 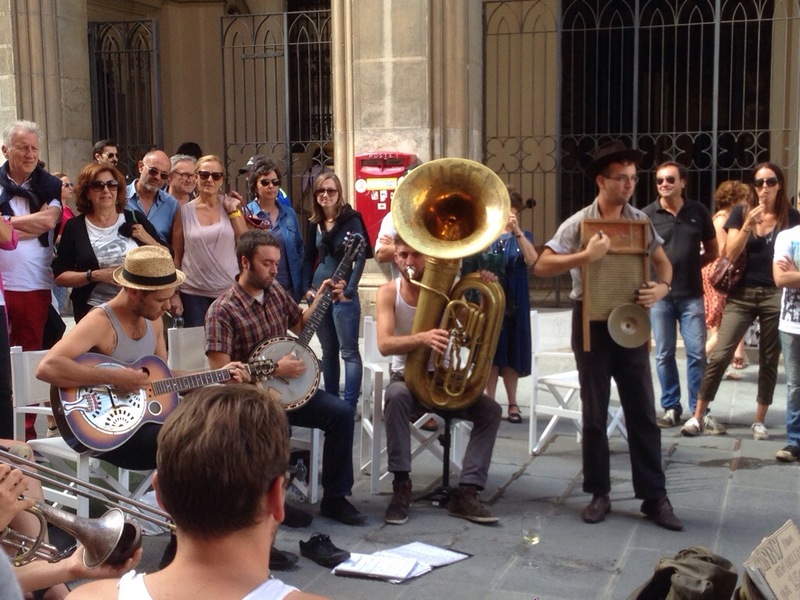 Later we encountered Tuba Skinny playing in Via Mazzini; they are a true traditional New Orleans jazz band, and they are phenomenal; they look the part as well as playing the parts. For Pedar, they are the best thing going at Umbria Jazz: they play the truth. He’s learned that the show must go on, even with equipment malfunctions; maybe someday he will be on the main stage. 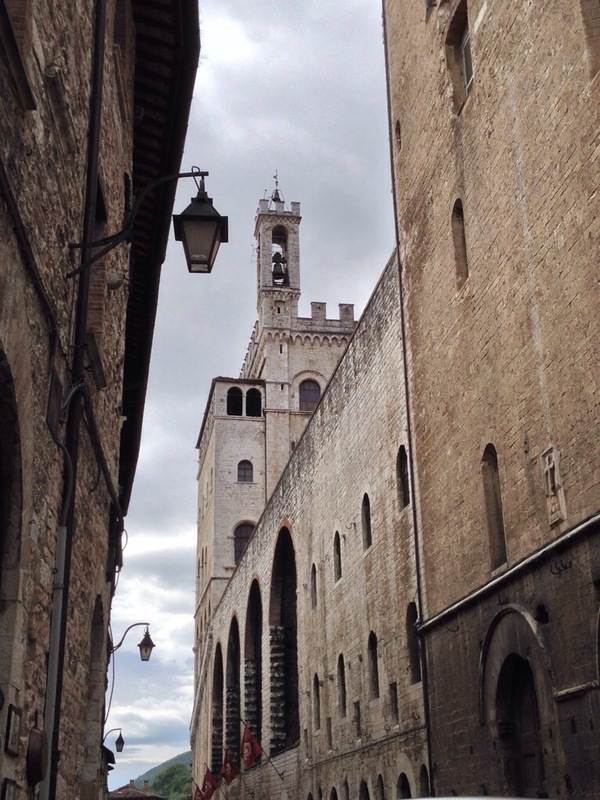 On Sunday, while Perugia was wrapped up in soccer fever, we got out of town and headed into the hills to visit the medieval town of Gubbio. Gubbio is an old mountain town, an hour from Perugia, whose Umbrian culture dates back well into the first millennium BC. In fact, the longest and most detailed liturgical documents from the classical world were found in the 15th century near the theater at Gubbio: seven bronze tablets of the 3rd-1st c. BC (the Iguvine Tablets) inscribed in Umbrian using the Etruscan and Latin alphabets, and now displayed in the Museo Civico. The tablets are concerned with religious rituals: purifying the town, purifying the mountain above the town, purifying the town’s army, procedures for sacrifices, and the operation of religious funds. As it was an auspicious day (Rebecca’s birthday), we took the opportunity for a visit. We arrived just after an important medieval-modern religious ceremony had begun to occur — the beginning of the Festa dei Ceri (Festival of the Candles). Essentially, the Festival centers on a ‘race’, held on May 15, from the town up Mt. Ingino to the Basilica of St. Ubaldo. 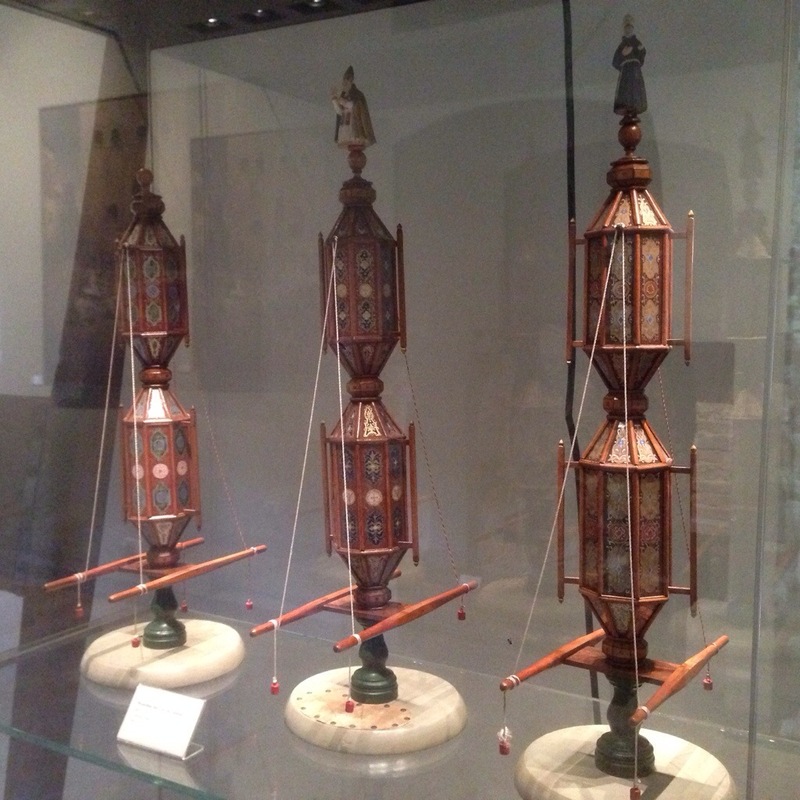 Groups of men, affiliated patrilineally to one of three saints: Sant’Ubaldo (patron saint of masons; his color is yellow); San Giorgio (patron saint of merchants; his color is blue); and Sant’Antonio Abate (patron saint of farmers and muleteers; his color is black), carry heavy wooden ‘candles’ topped by statues of their saints. Saturday night we attended a concert in the main piazza to celebrate Perugia being in the Finals of the competition for the European Capital of Culture in 2019 (Perugia has a joint bid with Assisi). One city from Bulgaria (between Plovdiv, Sofia, Varna and Veliko Turnovo), and one from Italy (between Perugia-Assisi, Siena, Ravenna, Lecce, Matera, and Cagliari) will be chosen for 2019. The benefits of this award to spark local cultural and infrastructural development can be considerable. The concert was by “Orchestra di Piazza Vittorio,” a group from Rome comprised of musicians from 10 different cultures. Songs were in Italian, Spanish, and Arabic, to name a few. They were good. The boys, however, decided to express themselves in their own manner. I think it is impossible for brothers to keep their hands off each other. Even a passing toddler decided he wanted to be part of it. Il Bartoccio – different versions of this Perugian character can be seen throughout the city. This is our local Via dei Priori version. This weekend marked the end of Carnevale celebrations in Perugia. For much of February there have been parties and parades, and it seems that each district, school, and club in Perugia had their own celebration. As with other festivals, like Epiphany, Perugia has its local traditions when it comes to Carnevale. People dress up, especially kids, but costumes are not elaborate (like in Venice) and there is a certain pride associated with the do-it-yourself look. 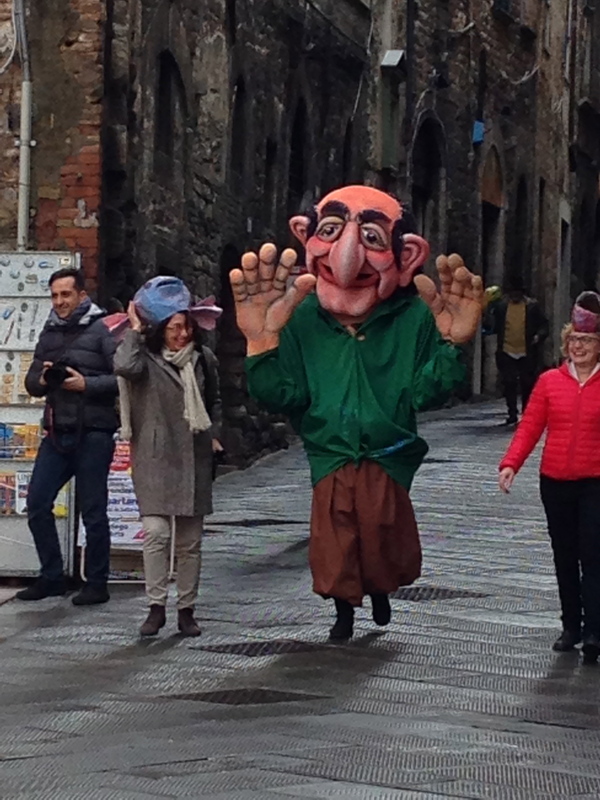 In keeping with Umbria’s rustic image, the traditional Perugian ‘mask’ of Carnevale is Il Bartoccio, an old farmer from the Tiber River valley. Il Bartoccio appears in Umbrian literature as early as the 1600’s. He is “rozzo, ma sagace, gioviale e saggio” (“uncouth, but shrewd, jovial and wise”). Il Bartoccio is credited with the first satirical attacks against the ruling classes. In the 1700’s his character was banned by the Vatican (Perugians were always at odds with the Papacy) but he was brought back after the Risorgimento (unification of Italy) in the 1860’s. Today he is considered a symbol of Perugia. On Saturday, we had our chance to parade with Il Bartoccio as Jakob’s class celebrated Carnevale on the Via dei Priori. This Wednesday was a holiday in Perugia for the patron saint San Costanzo. I was looking forward to having a day off from school and sleeping in, but my soccer coach organized a trip to Rome for the day with my team and his other team, the 2004s. We were supposed to go to see one of the practices of AS Roma and then we would have a private conference with the Pope in the afternoon. So I somehow managed to wake up at 4:45 in the morning and crawl onto the bus with my sack lunch. It took us forever to get there because we had to stop for kids to get snacks and have bathroom breaks. 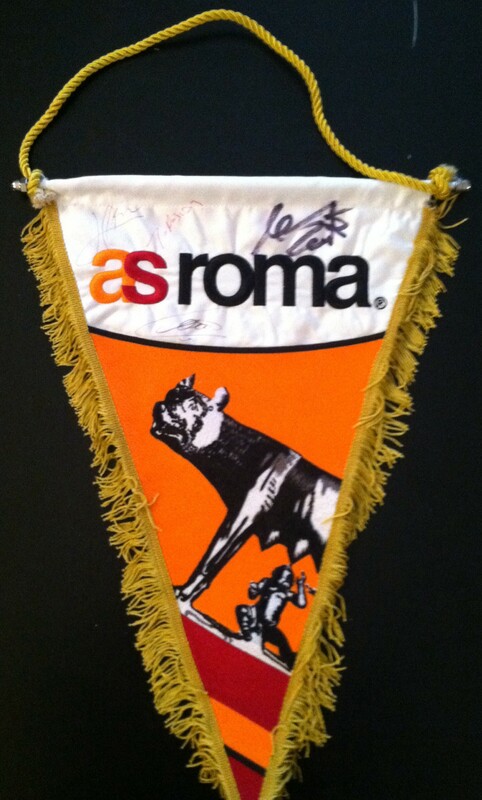 We got to Trigoria at about 11:00 but the practice didn’t start until 11:30. Once the practice started, I was surprised at how simple it was. They did running drills for the first 20 minutes and then they just did scrimmages for the rest of the time. After the practice they gave each of us a pennant and a hat. Then as the players were walking off we could get their signatures. 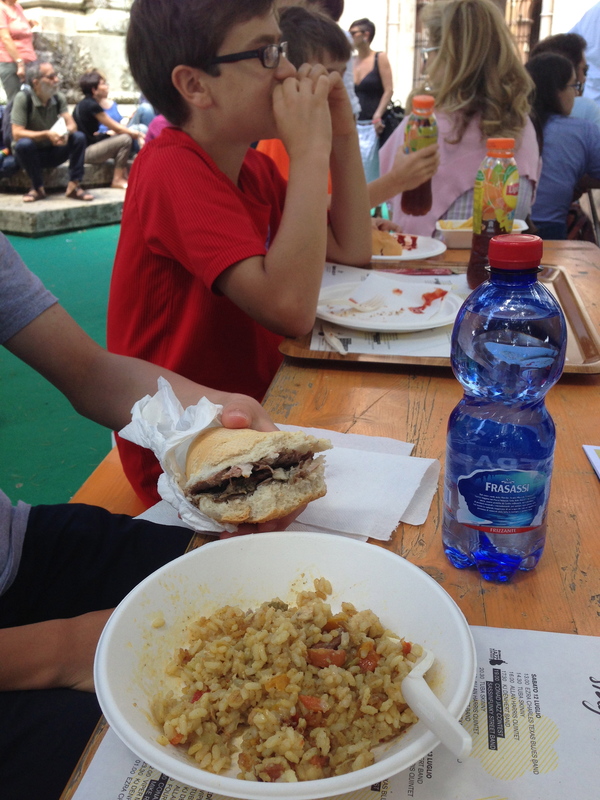 We left soon after that and we went to one of Don Bosco’s churches for lunch. Like I said, we were supposed to go see the Pope in the afternoon but for whatever reason we didn’t. Instead, we went to the center of Rome and saw the Colosseum where we had a team picture. Soon after that we got back on the bus to go home. I was disappointed that we didn’t get to see Papa Francesco, but I did get Francesco Totti‘s autograph, so I guess that’s just as good. The entrance to the Palazzo dei Priori. In the lunette, sculpted by an unknown artist ca. 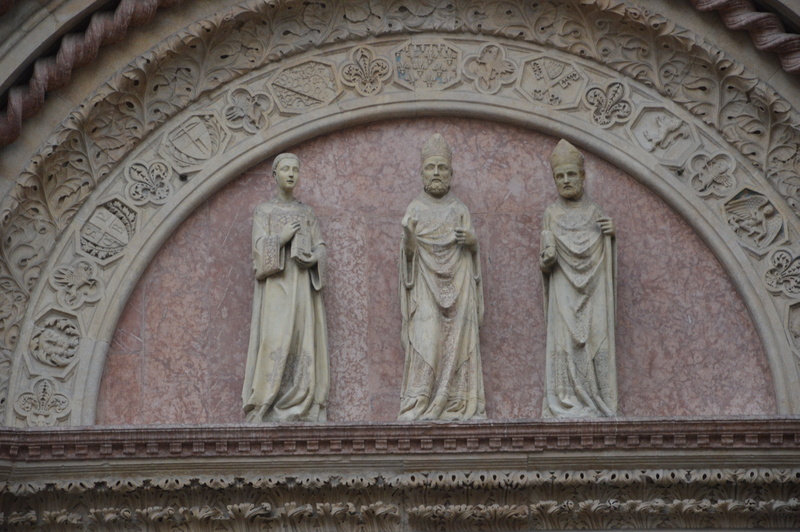 1315, are three of the patron saints of Perugia: San Lorenzo, San Ercolano, and San Constanzo. San Lodovico was canonized in 1319 and is not represented in the lunette. 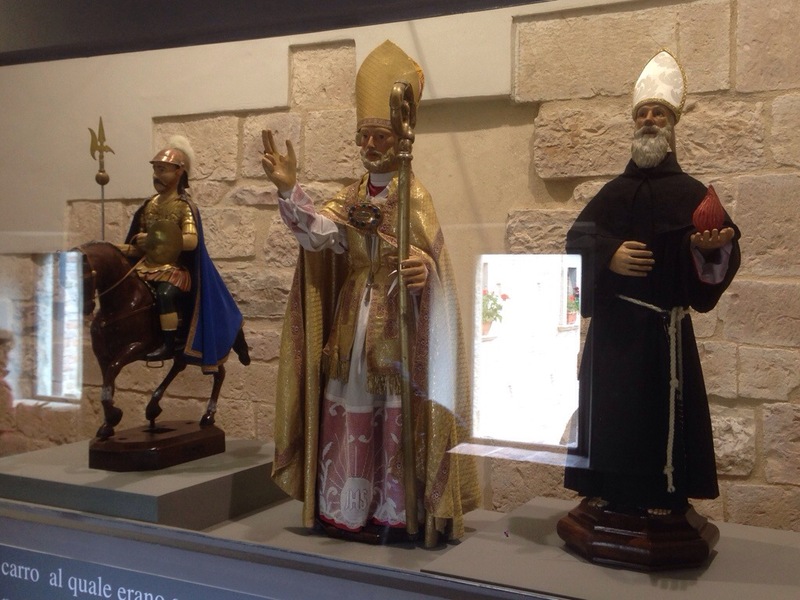 Today, 29 January, is the festa of Perugia’s patron saint, San Constanzo. There is no school (and no soccer practice! ), but the rest of the city is open, especially the bakeries, which spent the night making “Il Torcolo” – a special pastry made only once a year. San Constanzo, who lived during the II century CE, was the first bishop of Perugia. On 29 January 175 CE, during the prosecution of Christians under Marcus Aurelius, Constanzo became a martyr when he was beheaded by Roman soldiers near Foligno. The Romans took his head to the Emperor, while his followers carried his body back to Perugia. They had to travel through the woods and across fields. Along the way, many (unspecified) miracles occurred. They buried his body by the small hut in which he lived, outside the gates of city, not far from the site of the first Christian church in Perugia, San Pietro. In the 13th century, a church was built on the site. Although there are four patron saints of Perugia, today San Constanzo is the only one to have his own holiday.